In the garden of 3 Rede Avenue, Hexham, in 1971, two small stone heads were dug up by brothers Colin and Leslie Robson. The boys and their two 6cm high artefacts were to cause quite a stir in the months and years ahead, and the whole kerfuffle has still not been adequately explained to this day. The assumption was that the items were ancient and, after a series of mysterious happenings in the boys’ family home, quite possibly evil. The Robsons said that the heads would change position when left alone in a room, as well as experiencing other poltergeist-like activity. Even their neighbours, the Dodds, began seeing strange apparitions such as a half-man, half-sheep creature. The items were given to Hexham Priory, then Newcastle’s Museum of Antiquities, and eventually found their way to Celtic expert Dr Anne Ross, who herself reported strange goings-on. She said she saw a half-man, half-animal figure stalking around her Southampton home (among other incidents), whilst her daughter allegedly saw a werewolf-like creature on the stairs. Anyway, she soon got rid of the heads and the paranormal activity ceased. A few years later, though, a Hexham man by the name of Des Craigie claimed he had fashioned the heads in his lunchbreak for the amusement of his daughter back in the mid-1950s. 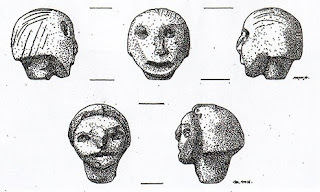 The Craigies had been previous occupants of the Robson’s house and the chap in question went to the trouble of making another replica head to prove his point. 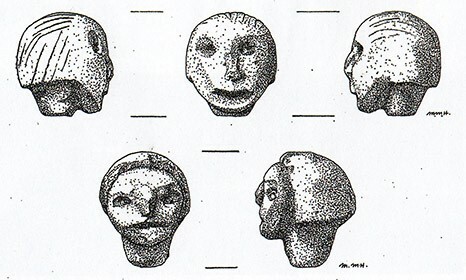 In the meantime, the original heads were examined by various experts who didn’t quite know what to make of them – though the assumption was, originally at least, that they were ancient. The mysterious heads were passed from pillar to post during the late 1970s, until, in around 1978, they were lost. And that was the end of that. Mickley, Northumberland, is not a very large village. It is known, historically, as the birthplace of the famous engraver, Thomas Bewick (at nearby Cherryburn Farm); but should, perhaps, be even better known for spawning one of the most celebrated football figures the region has ever produced: Bob Stokoe. The man is a Sunderland legend, of course, having managed the Wearsiders to that most unexpected FA Cup Final victory over the then mighty Leeds United in 1973. But he is closely linked with Newcastle United, too, having won the cup with the black ‘n’ whites as a player in 1955. In between these two momentous occasions he managed a string of lower league clubs with a varying degree of success. Robert Stokoe was born at Mickley on 21st September 1930 into a typical North-East mining community – in fact he was the son of a miner. He joined Newcastle United in 1947 as an apprentice, scored on his debut in 1950, and went on to play 288 matches for the club – mainly at centre-half, and punctuated by that 3-1 Cup Final win over Man City in 1955. 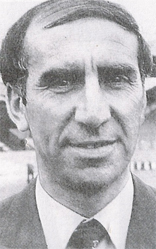 He left for Bury in 1960, joining initially as player-manager, then concentrating on management. He remained at Bury for five years – famously refusing a bribe, he claimed, from Leeds manager Don Revie to ‘throw’ a match. He then managed Charlton, Rochdale, Carlisle and Blackpool, before quietly taking charge at Sunderland in 1972. Then a second tier club, they shocked the football world by beating the imperious Leeds United 1-0 in the ’73 Cup Final – and a stunned nation watched Stokoe dash across the Wembley turf on the final whistle adorned in raincoat and trilby to embrace match hero, ‘keeper Jim Montgomery. After he left Sunderland in 1976, he moved in and out of various posts over the following decade – and, astonishingly, was never sacked at any of the twelve clubs he managed. He retired in 1987 – ironically overseeing Sunderland’s only ever relegation to the third tier of English football. He died in Hartlepool in 2004, aged 73. The incumbent, Rev Dwarris, who was a very influential man, simply refused to accept the sale of his home to Messr Blackett Beaumont and, well, just stayed put. The lord of the manor, keen to press on with his landscaping project regardless, was forced to build a large wall to both block out his view of the vicarage and to prevent the reverend poking his nose in. The ‘spite wall’ can still be seen today. Another major event in the village’s history was, of course, the Great Flood of November 1771. With Bywell still very much a working concern at the time, the watery influx had a calamitous effect on the lives of a great many people. Somewhat alarmingly, in the mayhem caused by the flood-waters ‘dead bodies and coffins were torn out of churchyards and the living and the dead promiscuously clashed in the torrent’ – and poor Bywell suffered more than most. The water rose eight feet up the walls of the recently built hall, and St.Peter’s Church was greatly damaged (and the parish records destroyed). At least ten houses were swept away, six folk drowned and farmers lost their cattle, corn and hay. Amidst the chaos, the lord’s valuable stud horses were safely got into St.Peter’s Church, before the building was itself overcome. In what must have been a bizarre scene, the poor beasts only managed to save themselves by hanging onto the tops of the pews with their teeth. It is said that the father-in-law of the great Thomas Bewick was present in the village at the time – and his horse ended up atop the altar table of the same church. One of Riding Mill’s most prominent landmarks these days is The Wellington Hotel public house, sitting, as it does, on the north side of the main thoroughfare of the village. It is a popular stopping off point for travellers, but few will be aware of the establishment’s grisly past. The building began life as a private residence in the mid 17th century, and was known originally as Riding House. Not long after its construction, though, it became embroiled in an extraordinary tale of alleged witchcraft and an unfortunate suicide. The story goes that in 1672 a young servant girl called Anne Armstrong had several of those episodes all too common at the time and began randomly accusing various individuals of dabbling in witchcraft. Anne lived at Birches Nook, Stocksfield, and after a minor argument with an old woman over some eggs she descended into a series of hysterical trances. Among her many rantings she accused three local women – Ann Forster of Stocksfield, Anne Dryden of Prudhoe and Lucy Thompson of Mickley – of dancing with the Devil and other shenanigans (including shape-shifting into various beasts) at Riding House. The case rumbled on until it was finally heard at Morpeth Quarter Sessions in 1673, whereupon the magistrates considered young Anne’s account far too fanciful and dismissed it. The three defendants were therefore acquitted, and the matter was considered to be at an end. Note: The case of the Riding Mill witch-hunt is considered to be unique in English witch trials, the various witchly goings-on having a distinctly ‘continental’ feel to them. Quite how a young North-East servant girl came to recount such stories has, however, never been properly explained.